Margaret Thatcher, the former British prime minister who became one of the most influential global leaders of the postwar period, died on Monday, April 8, 2013. LONDON—Margaret Thatcher, the former British prime minister who became one of the most influential global leaders of the postwar period, died on Monday, three decades after her championing of free-market economics and individual choice transformed Britain’s economy and her vigorous foreign policy played a key role in the end of the Cold War. “It is with great sadness that Mark and Carol Thatcher announced that their mother, Baroness Thatcher, died peacefully following a stroke this morning,” said Mrs. Thatcher’s spokesman, Timothy Bell. She was 87. Queen Elizabeth II and U.K. Prime Minister David Cameron immediately issued tributes, with Mr. Cameron saying: “We have lost a great leader, a great prime minister and a great Briton.” Mr. Cameron planned to cut short a trip across Europe and was due to return to London on Monday afternoon. Downing Street said Mrs. Thatcher’s funeral service will be held at London’s St. Paul’s Cathedral, and will be followed by a private cremation. No further details have been announced. Mrs. Thatcher, who grew up in an apartment without hot water above her father’s grocery store in Grantham, eastern England, went on to become Britain’s first female prime minister and arguably the country’s dominant political figure since Winston Churchill. She was a key ally and close friend of former U.S. President Ronald Reagan, sharing with him a view on free-market, monetarist solutions to the economic problems of the day, as well as an uncompromising stance on how to handle the former Soviet Union, earning her the nickname “the Iron Lady.” Together the two led a rightward shift in Western politics that extolled the virtues of a free-market economic system with little government intervention that has largely endured, though aspects, such as the deregulation of financial services, have been questioned during the credit crisis. In moves that were widely copied, Mrs. Thatcher took on Britain’s all-powerful trade unions and privatized state-run industries, governing with a take-no-prisoners style that earned her both admiration and dislike. “She showed everyone what a political leader with a powerful agenda could accomplish,” said George Shultz, who was secretary of state to Ronald Reagan. “She was the last outlier from the ideological wars against Marxism, an epoch-making politician, but an incredibly polarizing force,” said Patrick Dunleavy, professor of political science at the London School of Economics. In Europe, she is remembered as a prickly leader who thrived on confrontation, but who ultimately agreed to foster some of the European Union’s most significant developments, such as the creation of a single EU market. Mrs. Thatcher was forced from office after an interparty rebellion in 1990 after over 11½ years in power, making her the longest-serving 20th-century British prime minister. By the time the opposition Labour Party took power in 1997, its leader, Tony Blair, had forced his party to accept much of her legacy, dropping its commitment to nationalized industries and embracing free markets. Even her ideological enemies admired Mrs. Thatcher as a person of conviction who eschewed the focus-group politics that characterizes many in her line of work. “She said what she meant and meant what she said and did what she said she would do,” said Tony Benn, a radical left-wing minister in the Labour governments that preceded Mrs. Thatcher. Born Margaret Roberts on Oct. 13, 1925, in the Lincolnshire market town of Grantham to Alfred and Beatrice Roberts, Mrs. Thatcher was schooled from an early age in an ethic of hard work and self-reliance. She grew up in a house with no hot water and an outdoor toilet. Her father, a Methodist lay preacher, was active in local politics and a major early influence. “He taught her, don’t go with the herd if you think that the herd is wrong,” said Sir Bernard Ingham, who served as Mrs. Thatcher’s press secretary for 11 years. His interest in politics also provided the books and newspapers which would stimulate her own. The brutalities of World War II and the accounts of a young Austrian Jew for whom her father had arranged shelter in Grantham filled her with a hate of all totalitarianism. She later recalled in her autobiography that as a 13-year-old she took on a group of adults, to their “astonishment”, in a prewar fish-and-chip shop queue after one said that at least Adolf Hitler had given Germany back its self-respect. Mrs. Thatcher attended local state schools at a time when Conservative politicians were still mainly drafted from Britain’s elite private schools. She studied chemistry at Oxford University and spent her early career in research laboratories. Mrs. Thatcher took power following Britain’s “winter of discontent” of 1978-1979, in which nationwide strikes over pay by public-sector workers from gravediggers to garbage men brought an economy that had for years been growing at half the rate of its peers close to a standstill. In her first two years as prime minister, the nation’s economy shrank and unemployment rose by a million, hovering at three million until the mid-1980s. There was widespread rioting in inner cities as both these conditions and racial tensions fermented dissent. Mrs. Thatcher responded with radical reforms, shaped by the ideas of free-market economists Friedrich Hayek and Milton Friedman on minimizing government control and allowing markets free rein in deciding the shape of the economy. “Without economic liberty, there could be no true political liberty,” she told European leaders in 1979. She took on Britain’s then-powerful labor unions and whittled the size of the state through sweeping privatizations and the closure of unprofitable state-owned enterprises, from coal mines to steel plants. The resulting long showdown between striking coal miners and Mrs. Thatcher split the country. Mrs. Thatcher said those who stood in the middle of the road risked getting hit by traffic coming both ways. “I’m not here to be liked,” she often said. “It was obvious by the late ’70s and early ’80s that change was absolutely essential but there was no effort to try and manage the change with an expansion of vocational education or training for people whose whole economic life was being shattered,” said Neil Kinnock, who was leader of the opposition Labour Party for most of Mrs. Thatcher’s reign. Mrs. Thatcher relished an argument, and got so bored on vacations that young Conservative politicians were dispatched to join her family so she could argue politics, colleagues remember. “I watched some people in her presence who were intimidated and [would] not say much and I don’t think she liked that. She enjoyed a good argument,” said Mr. Shultz, a key figure in the Reagan administration. Britain’s economy recovered, in part as a result of the more flexible, U.S.-style labor markets she ushered in, helped by oil discoveries in the North Sea. In addition, Mrs. Thatcher began a widespread privatization program. Driven through amid often fierce public opposition, the program put inefficient, unprofitable state giants into private hands and provided a template for many other countries in Europe. By the end of 2009, state-run industry accounted for only 2% of the U.K. economy, compared with 10% in 1979. Her deregulation of the financial industry helped turn London from an increasingly obsolete financial center into a rival to Wall Street. Known as the “Big Bang,” for the many changes made at once, the 1987 deregulation moved trading from the floor to electronic screens and blew away barriers to entry, bringing in bankers and businesses from around the world. Mrs. Thatcher’s term was punctuated by several recessions. The worst, in the early 1980s, saw a peak-to-trough decline in output of 6%, though the more recent recession, caused by the credit crisis, has been worse. While her government reduced annual inflation from the double-digit figures of the 1970s, it was only in the 1990s that inflation came under control. “On macroeconomic policy, the record was patchy, but the theme throughout had been pro-business, pro-market,” which laid the foundation for later successes, said Ken Clarke, a minister in the current government, who was in Mrs. Thatcher’s cabinet throughout her time in power and became Treasury chief under her Conservative successor, John Major. The close and candid relationships Mrs. Thatcher formed with both Soviet leader Mikhail Gorbachev and Mr. Reagan, and her vocal support of the uncompromising U.S. position toward the Soviet Union, proved an important element in the end of the Cold War. At her first meeting with Mr. Gorbachev, she told her Soviet counterpart over lunch: “Welcome to the United Kingdom. I want our relationship to get off to a good start, and to make sure there is no misunderstanding between us—I hate Communism,” said Sir Bernard, her press secretary at the time. Her former Defense Minister Michael Heseltine challenged her for the party leadership. He failed to win, but garnered enough votes from Conservative members of Parliament to show they wanted a change. Mrs. Thatcher, who had won three national elections, was persuaded by her party and advisers to resign before a second ballot. John Major, her Treasury chief, became prime minister. An emotional Mrs. Thatcher left Number 10 Downing Street on Nov. 28, 1990, and went to sit in the House of Lords, the upper house of the U.K. Parliament. As Baroness Thatcher, she continued to attack old enemies for a while, such as the European Union, and to exert a sometimes-divisive influence within the Conservative Party. After a series of small strokes in March 2002 and the death of her husband, retired oil executive Denis Thatcher, she largely withdrew from public life the following year. 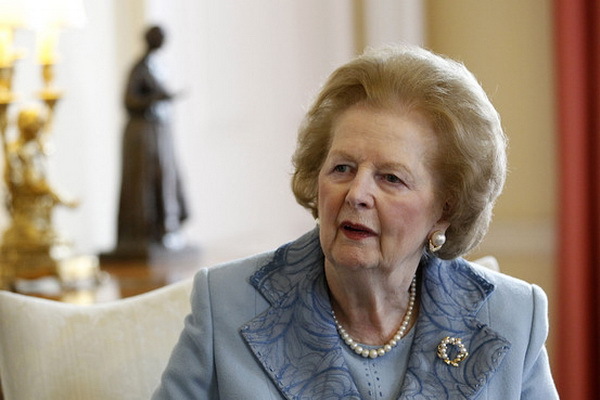 Former British Prime Minister Margaret Thatcher has died at 87 following a stroke, her spokesman has said. Thatcher was the first woman Prime Minister of England and also its longest serving, ruling from 1979–1990. Thatcher was known as the ‘iron lady’ for her uncompromising stance on many policy issues. Thatcher slams the Soviet Union for calling her the Iron Lady of the West. She changed us all. We went from being a people who saw ourselves as eternally on the downward slide to a nation that was proud to be British again. On the world stage too, she made Britain count once more. She was a startling presence who brought a strong and controversial style to our diplomacy after years of Foreign Office blandness. The words are those of Charles Powell, one of the closest aides of the “Iron Lady” during her time in power. Margaret Thatcher, who died on Monday aged 87, not only revolutionised the social order in her own country but did much to reshape world politics amid the crumbling of the Soviet empire. The UK’s first woman prime minister transformed a sclerotic British economy, all but neutered the trade unions and endeavoured “to roll back the frontiers of the state” with a policy of offloading the great nationalised industries and selling council houses to their occupants. Abroad, she was the indomitable leader who won victory over Argentina in the Falklands war, who decided that Mikhail Gorbachev was a Soviet leader she could “do business with” and who inspired a respect for “Thatcherism” as a political philosophy that was never quite matched on the domestic front. The flip side of her courage, toughness and radicalism was an arrogance, obstinacy and remoteness that became more marked the longer she clung to office. She centralised power to a degree not seen before in modern Britain. One result of the way she dominated government was her failure to heal the wounds opened up in her own Conservative party over her plans for a poll tax and her negative approach to the UK’s role in Europe. Yet such was the force of her presence that what came after her was defined in terms of her absence. Though far from poor by the standards of a provincial town in the Depression, the Roberts family had neither hot running water nor an indoor lavatory. Yet she and her sister Muriel were well-dressed – their mother was a seamstress – and in a class-conscious era the ambitious Margaret took elocution lessons when she went to Kesteven and Grantham girls school. She read chemistry at Somerville College, Oxford, then a huge achievement for a girl of her origins, and joined the university’s Conservative Association, becoming its president in 1946. After Oxford she worked as a research chemist but spent much time in Dartford, Kent, where she became party candidate. It was a hopeless seat for a Tory but at her adoption meeting she was offered a lift home by a wealthy businessman, a divorcé some 10 years her senior called Denis Thatcher. As he later said: “She stood for Dartford twice and lost twice, and the second time she cried on my shoulder I married her.” Denis was to give her unstinting support emotionally and financially throughout her career. In 1953 the couple had twins, Carol and Mark. Denis’s wealth meant they could afford a full-time nanny so motherhood did not stop her reading law, passing her Bar exams and in 1959 becoming MP for the London seat of Finchley. She stood out from the beginning. Westminster’s few women MPs tended to be older and unmarried whereas Thatcher, apart from her mastery of detail and her fluency as a speaker, was a young mother with an almost chocolate-box prettiness. She was made parliamentary secretary to the pensions minister and after the Conservatives’ 1964 defeat the new party leader, Edward Heath, promoted her to his shadow cabinet even though he had been warned that “if we take her we’ll never be able to get rid of her”. When Heath won the 1970 election she was given the cabinet post of education secretary. In the eyes of her contemporaries, however, she was still the token woman in the government. She might have remained such, but for her performance as a minister and her ability to capitalise on her luck. As education minister she approved more comprehensive school schemes than anyone before or since, and she earned notoriety by ending free milk for pupils over eight. “Maggie Thatcher, milk snatcher,” became the first of many derogatory slogans applied to her throughout her political life. She formed an alliance with Sir Keith Joseph, a tortured intellectual of the right, who was appalled when Heath performed his great U-turn, back towards the corporate state and the imposition of controls over prices and incomes. By the time the Heath government fell in February 1974, Joseph’s circle was increasingly influential. Heath lost a second election that October yet declined to stand down. Had he done so, any one of a number of prominent male colleagues might have succeeded him. Probably Thatcher would not have made the attempt. But as the manoeuvring proceeded the men wrote themselves out. When Joseph refused to stand following an ill-judged speech about working-class inbreeding, she said she would do so “because somebody with our viewpoint has to stand”. Airey Neave, an anti-Heath backbencher who was later murdered by the INLA, put his organising talents, and a list of supporters already garnered, at her disposal. She trounced Heath on the first ballot and clinched the leadership against a pile of second-rounders. As Opposition leader she and her team evolved a statement of principles entitled The Right Approach to the Economy. Its essence was monetary and fiscal prudence, the detachment of the trade unions from the management of national affairs and a reduction in the role of the state. It became a foundation document of Thatcherism. Soon she had made her mark, not just at home but also on the world stage – much helped by an early speech attacking the Soviet Union, which led the Red Army to come up with the “Iron Lady” epithet. Oppositions often depend on the incumbent government destroying itself. Labour obliged. The 1978-79 “winter of discontent” was marked by public sector strikes that left rubbish piled high in the streets and the dead unburied. Labour’s electoral hopes were destroyed for a decade. When Thatcher came to power in 1979 the British polity was in a mess. Inflation and unemployment were rising and the unions to many seemed out of control. Against all conventional wisdom, she took an axe to public spending. At one celebrated meeting she even demanded an extra £1bn cut in spite of warnings from those present that the country would fall apart. The economic medicine was hard to stomach. Unemployment rose above 3m, manufacturing output fell and the new prime minister’s poll rating slid. Yet by 1983, inflation was down below 4 per cent from a peak of 22 per cent and the Conservatives’ ratings were up again. Years later Lord Carrington, who became her foreign secretary, said: “Her finest hour really was with the economy and changing people’s perceptions of what we ought to be doing.” It was, he said, greater even than her display of leadership in the Falklands war. When Argentina invaded the Falkland Islands in 1982, Thatcher barely hesitated before sending a 25,000-strong military task force to reclaim the tiny colony. Victory and her unswerving purpose throughout the war cemented her image of determination at home and abroad. So too did her successful, table-thumping battles to reduce the UK’s contribution to the European Community budget, insisting: “I want my money back.” Despite being described by François Mitterrand, then the president of France, as having “the lips of Marilyn Monroe and the eyes of Caligula”, her European and global fan club multiplied. Her election victory in 1983, against a Labour party led by the elderly Michael Foot, seems in retrospect to have been almost too easy. If Britain’s military triumph in the South Atlantic was the most dramatic event of her first term, the vanquishing on a peacetime battlefield of the National Union of Mineworkers was the outstanding victory of her second. It was a bloody conflict with communities torn apart and pitched battles between miners and the police. Yet the NUM, previously regarded as invincible by any government, was eventually forced to back down. On the economic front, Thatcher continued the battle to “roll back the frontiers of the state”. Privatisation began with National Freight and was extended to include steel, gas, telecommunications and water. State support for private industry was phased out. Local authority homes were sold at a discount to tenants, dramatically boosting home ownership though at the cost of an enduring void in housing provision for the poor. It was her opposition to communism that helped bring about what she later regarded as her greatest achievement: the collapse of the Soviet empire. Her decade in Downing Street coincided with Ronald Reagan’s eight years in the White House and the two became political soul mates. She supported Reagan as he brought the Russians to their knees by his willingness to outspend them on defence. At the same time she encouraged Mr Gorbachev’s reform programme, recognising that it could help destroy collectivism from within. She won the hearts of much of the Soviet public in a barnstorming visit in 1987. Complete with a stunning new wardrobe, as one aide said she “came on like a modern Tsarina”. Barely two years later the Berlin Wall fell. At home, however, her attitude to Europe was the cause of political setbacks. One of the biggest was the dramatic departure from her cabinet of Michael Heseltine, who walked out following a row over whether the Americans or Europeans should rescue the Westland helicopter company. On the surface she remained unruffled. She even recovered, although only temporarily, from the resignation of Nigel Lawson as chancellor of the exchequer. Her strident tone dismayed pro-Europeans in her cabinet. Thatcher was unrepentant and the wound festered. So too did that caused by her plans to introduce a regressive local government poll tax in the face of widescale opposition from Tories. By the time of her 10th anniversary as prime minister, it could be seen by others, but not by her, that she had been in office long enough. In 1989 a pro-European backbencher, Sir Anthony Meyer, stood against her and garnered enough votes to show there was real discontent in the parliamentary party. The coup de grâce came the following year from Geoffrey Howe, her former chancellor and foreign secretary, who stunned the House of Commons by suggesting in his resignation speech that Thatcher’s attitude was “like sending your opening batsmen to the crease only for them to find, the moment the first balls are bowled, that their bats have been broken before the game by the team captain”. A few days later Mr Heseltine, her long-time opponent, stood against her. A badly organised campaign, and an arrogance that saw her flying off to Paris on the night of the vote, brought about what many had believed unthinkable: she failed to win outright on the first ballot. She had been proved mortal. Discontent over poll tax, her anti-European stance and her imperious style led her cabinet, one by one, to tell her that she should go. The trauma of her unseating was to ravage Tory unity for years. One small consolation for her was that John Major, not Mr Heseltine, succeeded her. Although they stayed in power until ousted by Tony Blair and New Labour in 1997, the Tories were deeply scarred by the manner of her departure. It was to be 20 years before it entirely regained its confidence and momentum. Thatcher lived to see her party return to power under David Cameron in 2010 but she was too frail to attend the 85th birthday party in Number 10 that had been arranged for her. She had never fully recovered from her abrupt and forced exit from frontline politics. In 1992 she went to the House of Lords as Baroness Thatcher of Kesteven. For a while, on the international lecture circuit she received ecstatic receptions from foreign audiences, amazed that the British had ditched her. But it was not the same. Her health started to deteriorate. In 2004 Sir Denis, made a hereditary baronet in his wife’s resignation honours, died and she was left alone. She battled on, but her best moments were when she met old friends to talk about past triumphs and to dream of marching into Downing Street and making Britain great again.